As cycle campaigners, it is often the bad and dangerous, or more often than not, the lack of cycling infrastructure that we shout about. However, there is also some infrastructure around that we actually really do like, and would love to see more of. 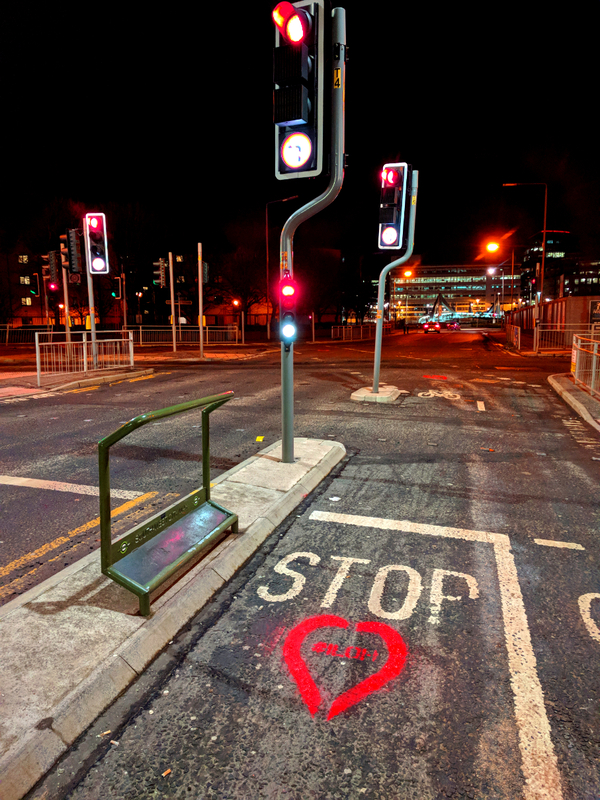 To celebrate Valentine’s Day, the Cycling Embassy of Great Britain updated their Insert Loved One Here image creator, to enable people to show their love for genuinely good cycling infrastructure. 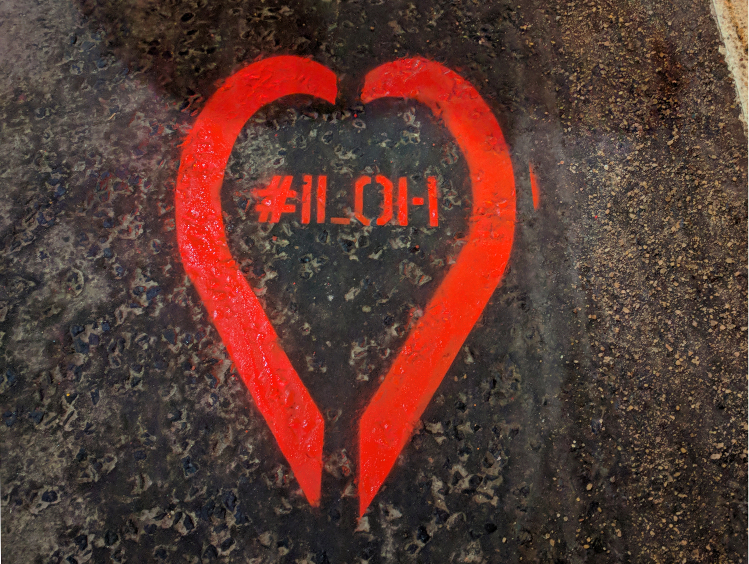 Here in Glasgow, we decided to take make this physical, and had some stencils created with a love heart and the #iloh hashtag. 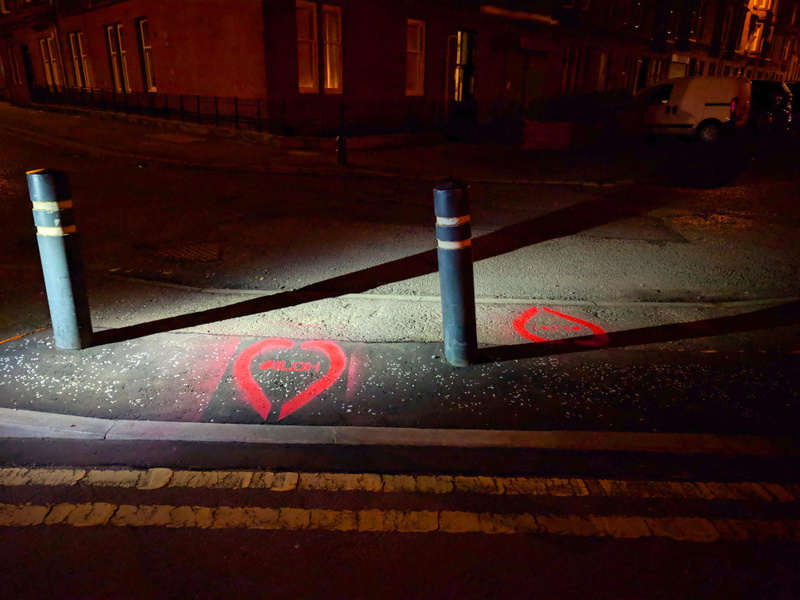 An intrepid group of GoBike volunteers took to the rather chilly streets on the evening of the 13th of February, so that Glasgow could wake up the next morning to find a little bit of cycling infrastructure love. Here, we show you the bits we chose and why. We are suckers for a good bit of contra flow cycling infrastructure, and St Andrews Street is a good illustration, providing a very pleasant back drop for a photo. It is a part of the East City Way, and a legacy from the Commonwealth Games. 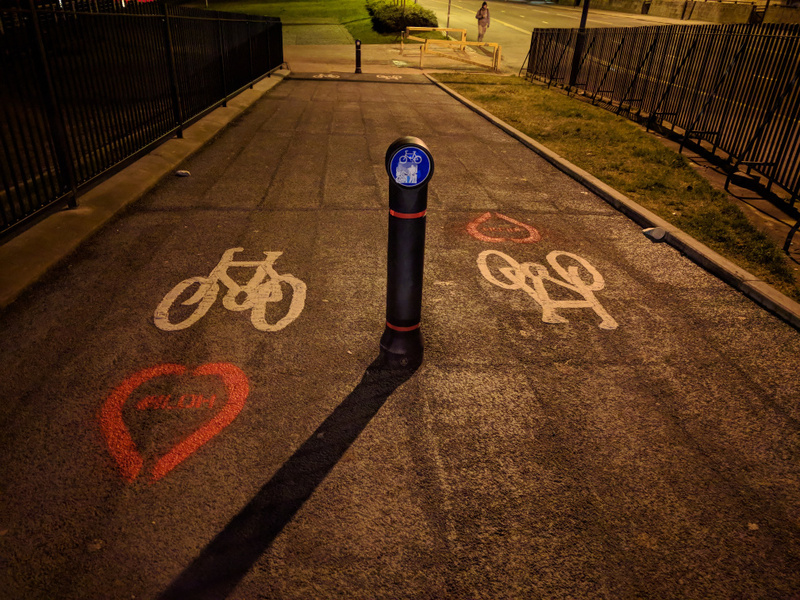 There are issues at either end, but overall this is a good, short piece of protected cycling infrastructure, deserving of some love and replication across the city. This relatively new section of cycle path along Clyde Street provides a more direct route when crossing at the Victoria Bridge. 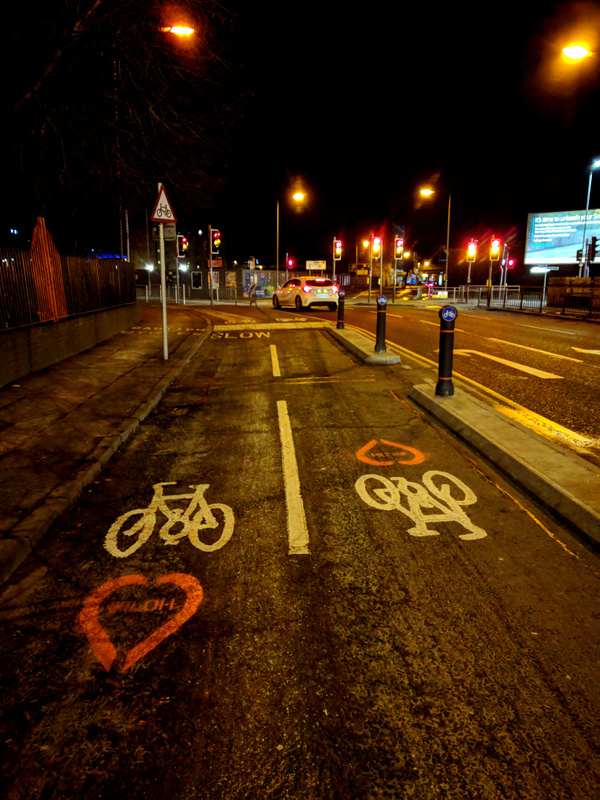 It has removed a pinch point along the shared use pavement, which had been narrowed due to traffic lights. A welcome addition to the NCN7. We are not big fans of Advance Stop Lines, as these very often bring cyclists into conflict with motor vehicles. 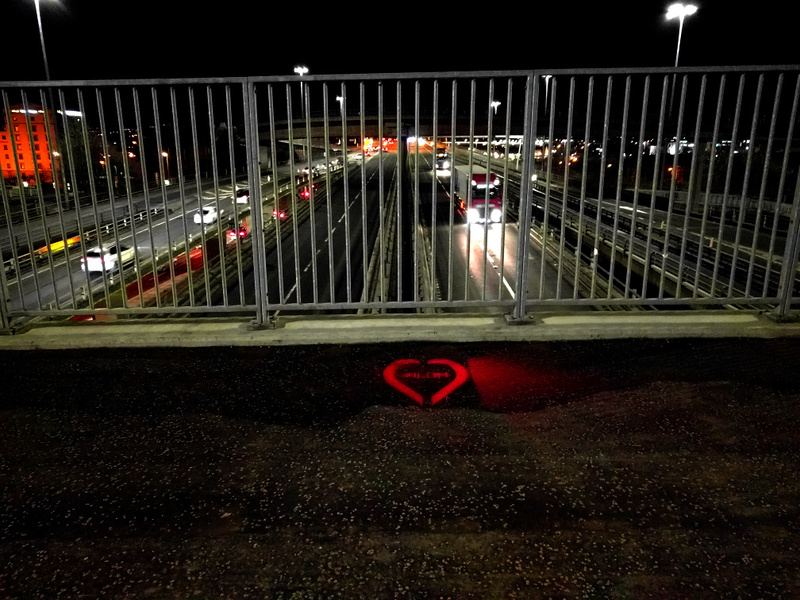 However, we really do like the Advance Start Light at Clyde Place which helps to reduce this conflict. Our photo doesn’t fully do this justice – a video would have shown this in all its glory – but it is a lovely sight to behold when at the head of a towering line of motor traffic. We look forward to seeing more of these in the future. A text book bi-directional protected cycle lane, that enables contra flow cycling along Clyde Place. 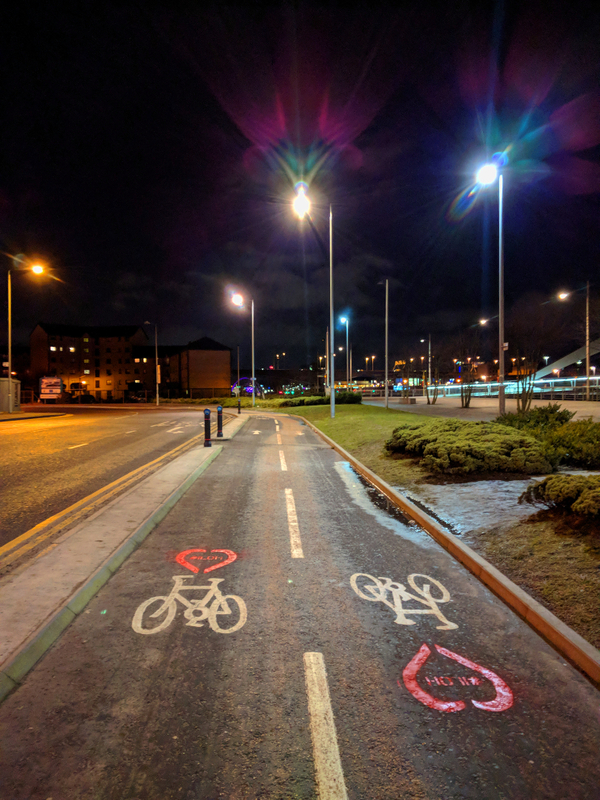 Part of the beauty of this is that rather than take away from the wide path or landscaping along Clyde Place, a section of the road has been given over to the cycle lane. Much love and much use from a number of our GoBike committee members in their every day trips. Two of our favourite pieces of South City Way infrastructure, the hand rail/foot rest and the diagonal crossing. The hand rails along the route, seen widely in Copenhagen, are a work of genius, as not only do they allow you to keep your feet on the pedals, but they also put you in the correct place for the sensor to pick you up, causing the light to turn green. The cycle only diagonal crossing has its own traffic light phase. Rather than having to cross two arms of the junction, this direct route gets cyclists to the West Street junction much quicker. This stretch, which takes you all the way to the Quayside, is a good example of linking different cultural and entertainment centres within Glasgow, reducing the need for cars to take people on short journeys. This is key to a people-centric transport network. If only this continued along Paisley Road West! 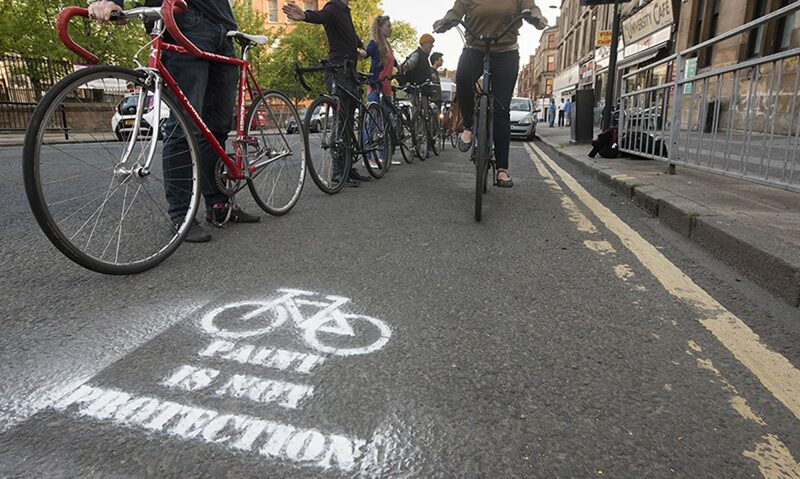 Those who came to the Cycling Embassy of Great Britain’s AGM in Glasgow last October, were taken on an Infrastructure Safari. During this, a new piece of infrastructure was christened the “Glasgow Kerb”. These are found where a dropped kerb has not been dropped enough to sit flush with the tarmac it leads to, and in most places are still raised from it by around an 2.5cm (an inch in old money). 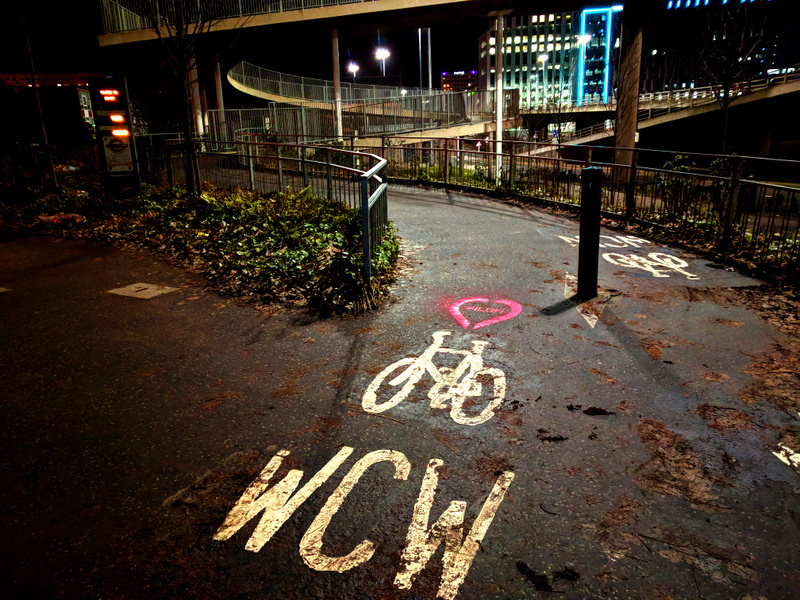 These are uncomfortable to cycle over, and to other users such as parents with prams, or those in wheel chairs, they can be difficult to ramp up. 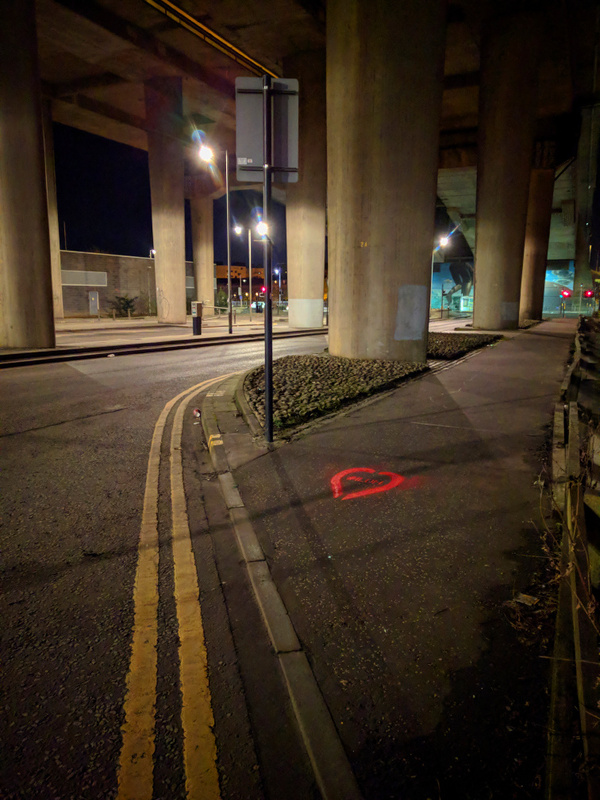 We highlighted this area under the Kingston Bridge because old “Glasgow Kerbs” found here have now been improved to be made flush with the road crossing. A small but very important infrastructure change. 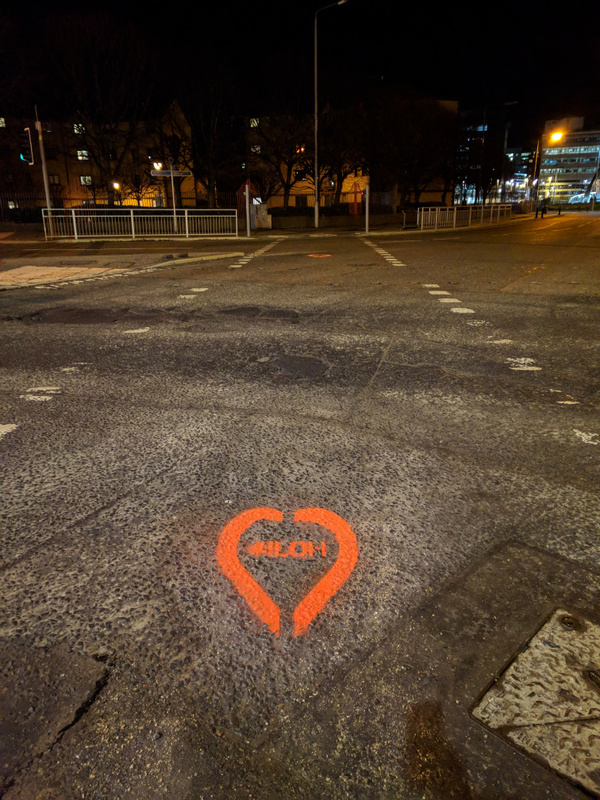 This almost didn’t get the love, as we are in February, and leaves have still not been cleared properly from here – really Glasgow City Council? 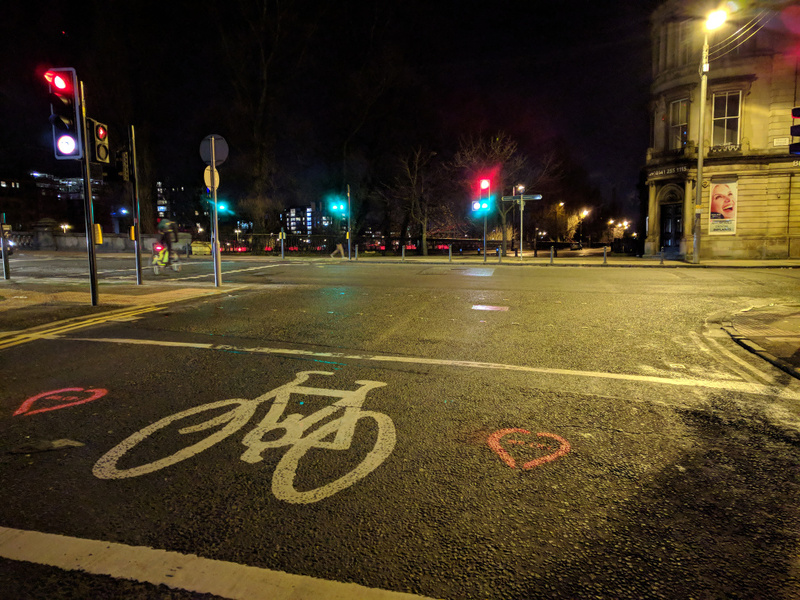 However, as an important junction, and with the cycle counter in the background, a debate was won to persuade us to give it one heart. There is something really satisfying about cycling over this bridge at rush hour, with all the cars at a stand still below, although we would recommend doing this when there is a reasonable breeze to dissipate all the fumes. This is a fitting end to our evening of love. Although there has been a general focus on some of the big cycle infrastructure projects, when we say big, they are still minuscule in comparison to road infrastructure projects. It is often the small things that can make a difference to every day cycling. The new dropped kerbs on Reidvale Street will now enable permeability along the street for cyclists, providing a quieter route from Duke Street to Bellgrove Train Station. These little things can mean a lot to many of the people who use these routes. 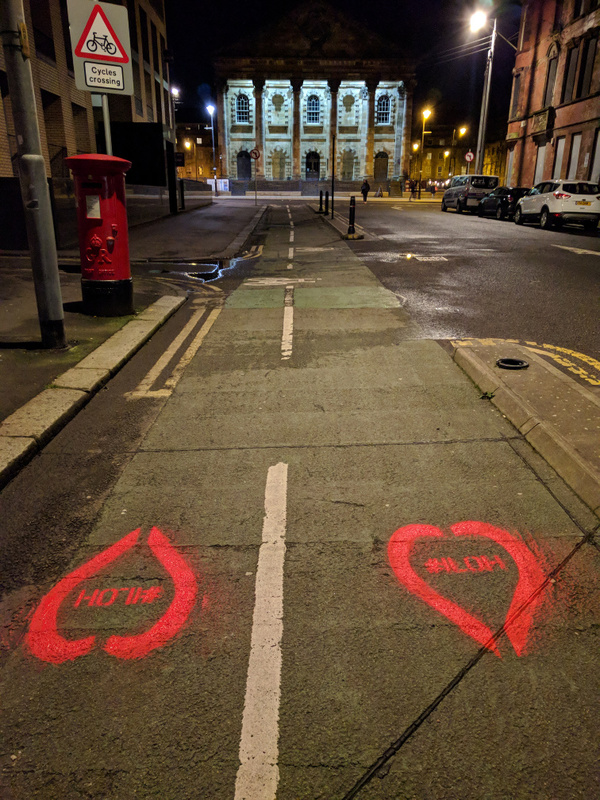 Our evening of tagging has hopefully shown our councils what quality cycling infrastructure should look like, and that it can be delivered. We hope to see many more examples of this in the future, and look forward to undertaking a similar exercise on Sauchiehall Street and Victoria Road, when those new schemes are completed. We would also hope that the examples of dangerous infrastructure in the last blog post are upgraded to include some of the features outlined here. 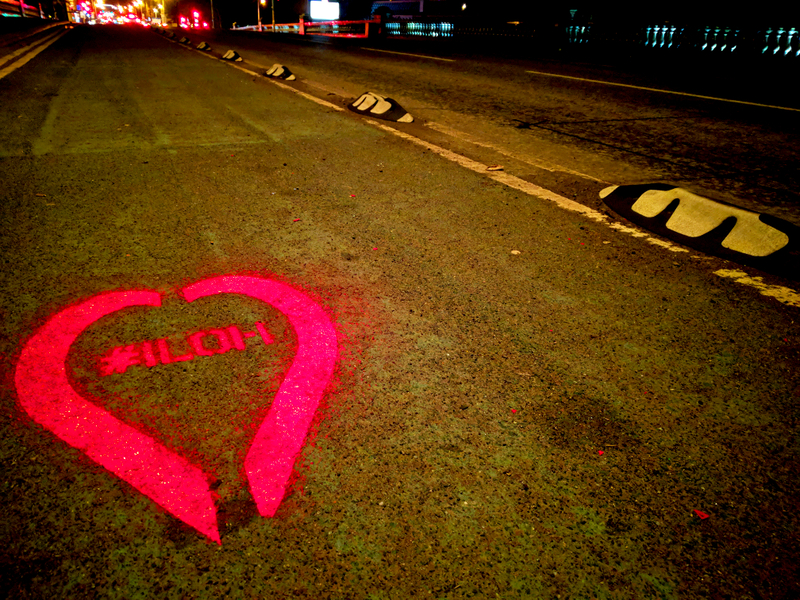 So that’s all from our adventures taking Insert Loved One Here to the streets of Glasgow… for now.